asks Tanu, why you didn’t come to talk to me, Tanu taunts saying i like to stay with intelligent people, Tanu says your plan to kill Pragya has flopped, Alaiya says everyone taunted me why i didn’t meet Pragya at hospital, Tanu says i had to so so much drama to keep myself out of it. Kiara brings soup for Pragya, makes her drink, it turns out to a kadha. Pragya says you have become good at acting like me, you are being my mother now. Kiara gives a tight hug to Pragya, she asks what happened, Kiara says i am sorry i didn’t come to meet you at hospital, she reveals that i was in police station. She says that she witness the murder of a guy, who was apparently in the same party as you were and dadda (King) said that the jhumar that feel in the party was not accident but on purpose, pragya is shocked. 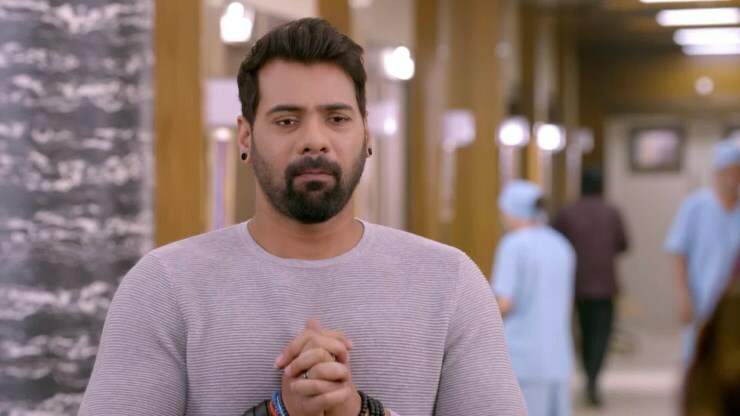 Pragya wonders if King investigates this matter at Abhi’s house, Abhi might soon find out that Kaira is his daughter and what if he takes her away from me. She is tensed.Abhi was changing the dress and miss Pragya always choosing his clothes. He wonders why he couldn’t still forget her with time. He holds Fuggy in his hands and cries. At home, Tannu wonders why Robin didn’t come out of his room. She comes to his room and questions if she must come to his room to ask for green tea. Robin apologizes to serve as his brother John has died, he is leaving for his village. He will surely arrange something for the house chores. He wants to pray for peace of his brother, and pray that his brother’s murderer dies a worse death. Tannu says maybe it was an accident. John says someone has seen the murder himself. Tannu stops Robin and asks him about the witness? She says the witness must have spotted the face of the murderer and may help them in police investigation. She tries to inquire about their whereabouts. Tannu says the matter is related to their family, someone might claim witness for money or fame as well. She convinces Robin to share the details of that witness. Robbin says Kiara! Tannu was shocked. Tannu recalls all the times Kiara showed a rude attitude towards Pragya. She decides to do something. The elders were crying at home. Everyone wonder why police is even coming home. Aaliya comes there asking if Pragya again got hospitalized. Disha replies she is fine, and will remain well. Dasi scolds to Aaliya for ruining the atmosphere. Mitali says police is coming here. Abhi also reach home along with the police. The inspector was strict with his job and clarifies he came for investigation of an attempt to murder case. It’s about Pragya. He asks what she was doing here. Abhi says she was invited, Tannu invited her. The inspector wanted cross-question. He asks Abhi why King and Pragya were invited when King is Abhi’s rival. Abhi says there was a professional rivalry only taking an album. The inspector points towards Aaliya for bribing and getting Abhi’s solo photo over that album. Aaliya was offensive. Abhi tells the inspector to do his job and give them punishment as well, claim that Dasi or Purab tried to kill Pragya. The inspector asks why such soft corner for his friend’s wife, is there some feelings he hold for her? Tannu come to the hall then. The inspector sends his subordinate for finger prints. Tannu was worried about her finger prints all around. The inspector tells Tannu they must wait for finger prints, he may begin questioning with her later.